OCEANSIDE — College pride filled the packed concert hall as trustees, students, faculty, administration and community members welcomed MiraCosta College superintendent and president Dr. Sunita “Sunny” Cooke on Jan. 16. “She has proven in her previous posts that she is a visionary and an effective leader,” David Broad, board of trustees president, said. Cooke is the sixth superintendent since the 80-year-old institution became a college in 1964. During the inaugural celebration Cooke talked about her background. She was born in India, and immigrated to the U.S. with her family in order to escape the caste system there when she was 5. Her family of five was allowed to enter the country with $8 per person. She said her parents’ hard work and gratitude during her early years taught her humility and resilience. Cooke said her childhood also helped her appreciate the opportunities for education and betterment in the U.S. She went on to earn a doctorate in biology at Georgetown University and complete a postdoctoral program at MD Anderson Cancer Center in Huston, Texas. Cooke has taught for 13 years, and served as president of Grossmont College from 2007 to 2014. She said she feels she has come full circle from where she started, and appreciates that she can make a difference in others’ lives as a college superintendent. “I could not be happier about joining the fine faculty, staff and administrators of MiraCosta College as we continue to build on the 80-year tradition of excellence in service to students and our community,” Cooke said. Cooke also spoke about her vision for the college and said she will focus on accountability and matrixes that matter as she looks ahead to the upcoming 2016 accreditation process. She added serving students who conquer academic and life challenges to complete an associate degree is equally as important as educating students who transfer with honors to a university. 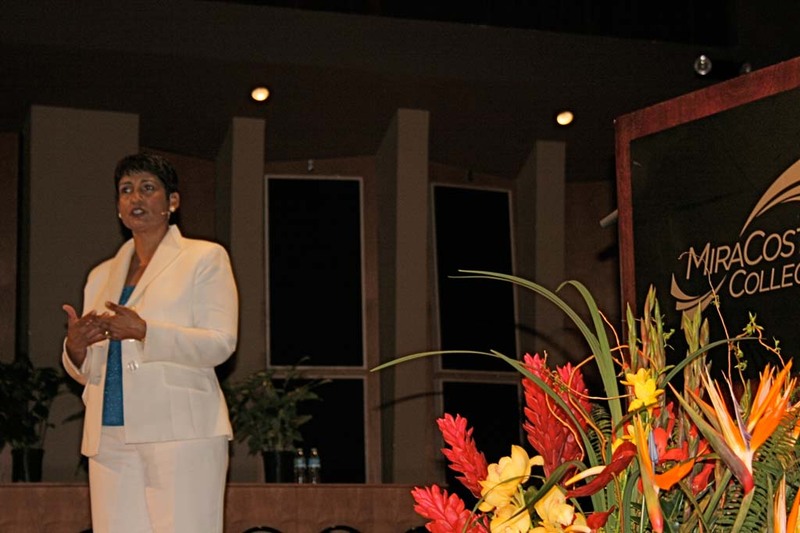 Cooke was hired as MiraCosta College superintendent on Jan. 2.